The flock is ready for the long Labor Day weekend, and we have the perfect kid friendly activity to usher in fall. We can only hope and pray that fall is around the bend, because honestly there is enough heat and moisture in the air to cut it with a butter knife! Nonetheless, we are super excited for the traditions that the season fall brings. Back to school (you already know we love that! ), college football, yummy food, family gatherings, pumpkins, and these adorable owls! Follow the directions on the cake box to make cupcakes. Let the cupcakes cool completely and then add your icing. Your mini pastry chefs can decide if they would like to create a brown owl or white owl. If they would like a brown owl, have them put a handful of Coco Puffs into a resealable baggie and crush. Sprinkle cereal crumbs on top of the cupcake. Carefully twist apart two Oreo cookies to use as the owl’s eyes. You’ll need to use two so that you can have two eyes that are covered in the yummy white frosting! Place a Sixlet candy on the icing to finish off the owl’s eyes. Now using your shaved almonds create wings for the owls by making staggered rows. Your final touch will be the beak. Let your kids use their creativity! They can shape a Goldfish cracker into the beak, or even bite off the corner of a Cheez-It cracker. 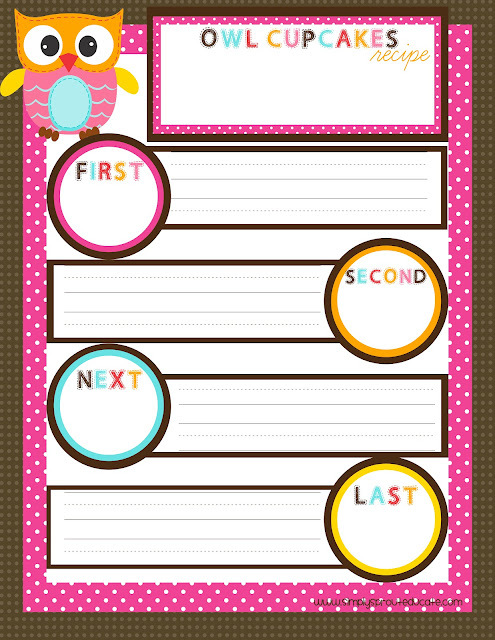 Extend the fun and learning with a journaling activity that has your little owls practicing their writing and sequencing skills. Simply save the image below into a Word document and print for your kids.